From the $9.8 million discovered in a fireproof safe in a decrepit bunker in Kaduna, to the $37.5 million mansion in high brow Banana Island allegedly owned by former Minister of Petroleum, Diezani Alison-Madueke back in February, to the latest finding of a stash of about N15 billion in Ikoyi, all credited to the whistle-blower’s alert, it is clear that this new policy is a win-win situation for the country, as well as ordinary citizens who can not only gain satisfaction from knowing that those who have dipped their hands into Nigeria’s treasury are more likely to be caught now, but have also been given a chance to become rich simply by snitching on some greedy politician or government official. Do due diligence: This should go without saying, but it’s important to mention it all the same. Like any other business, and even more so, the whistle-blowing venture should not be embarked upon without doing due diligence. You’ll need a map or at least a good navigation/geographical knowledge of the highbrow areas in Lagos and Abuja for instance. Your target areas should be Ikoyi, Victoria Island and Lekki for Lagos, and Maitama, Asokoro, Garki and Wuse 2 in Abuja. A good binoculars, a sturdy pair of running and climbing shoes, surveying equipment and a hundred percent sharpened instinct should be your allies in this covert operation. If you are poor at tree climbing, you’ll have to up your game in that area. Depending on your stamina and level of determination you can decide to take a street or two in one day. You know what they say about the fattest dog; if you are diligent and patient, soon enough you’ll likely be onto something worthy of blowing that precious whistle. Engage the right people: One of the first things you need to realize early enough in this whistle-blowing business is that except you’re fortunate enough to have an uncle or family friend whom you’re already certain has a huge amount of cash stacked somewhere, you cannot pull off this assignment alone. You’ll need to engage other people. An ability to spot disgruntled looking gate men, drivers, chefs and domestic staff in general from a distance is an art you must master. Your cajoling skills will come in handy here. Please do not just accost them from the blues to broach the subject of whistle-blowing. Buy a thing or two from the Aboki guarding the house, make small talk, gain his friendship and loyalty over time before you casually and indirectly introduce your mission. Let them understand that they will get a handsome reward at the end of the day; a reward that will end their romance with poverty in a heartbeat. Once you have the guard or domestic help on your side, the job is half-done. Don’t be greedy: Greed is often at the root of many business deals gone awry. To be successful in your whistle blowing business you must eschew greed. Be willing to part with 1-2 percent of the 5 percent promised by the government. Imagine if at the end of the day, you ended up even only with 3 percent of the N15 billion discovered in the Osborne apartment. It automatically means you would have made a staggering N450 million from just one act of whistle-blowing! That’s a lot more than many will make in a lifetime. It’s the reason you cannot afford to be greedy. Take your time. Don’t be in a hurry to “hammer.” Stay loyal to the people you have employed to assist in getting the job done. More so, you never know if their services will be needed with future deals. A domestic help can give information about “oga’s” friends and associates who also have illegal cash hidden in some empty apartment. Be circumspect: The job is not done until it is done. Even if you feel you are onto something big, you should never betray any emotion or display a body language that suggests that you are. Keep a level head. Don’t let the thoughts of becoming a sudden multi-millionaire lead you to become reckless. Your words, your actions, your every move are all important at this point in time and will determine how far you’ll go in the whistle-blowing profession. Your strategy for prospecting potential stash locations could be hijacked by a desperate fellow. Keep your cards close to your chest and deal them one after the other. Protect yourself: See, it would be foolish to expect any form of protection from the government even if you have been promised some. Please devise a means of protecting yourself. You may have been cautious and believe you have all your bases covered; but things go wrong sometimes. Somehow, someone might discover you are a whistle-blower and decide to exact their pound of flesh from you. You don’t want to be caught off guard. Now, how you intend to go about protecting yourself depends entirely on you. You may choose to hire the services of body guards or opt for a more “natural” form of protection. It’s your call. But, remember, you cannot be making all that kind of money only to leave yourself vulnerable to attacks. 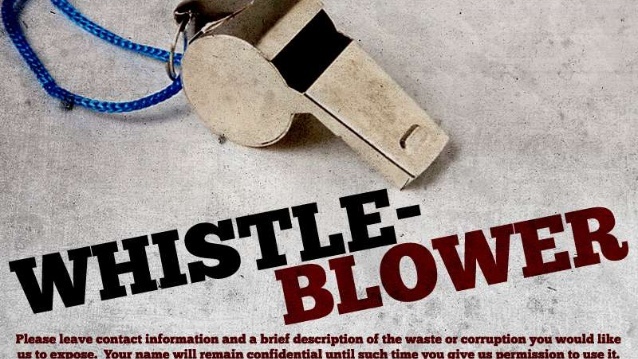 These are my tips for anyone who’s interested in getting into the whistle-blowing game. You may add any other factors you consider important to this list in the comment section. Like I mentioned earlier, I am feeling quite generous that’s why I chose to share what should be my own little secret with the rest of you. Great stuff! I am expectant. Good insight. The most important is engaging the right set of network. Now i can say information is money!!! It sure is. Thanks Coach! Business Strategist/Consultant. My sister i expected to see your consultancy fee. People often despise free services. Haha! You’re right, I won’t be so generous next time.